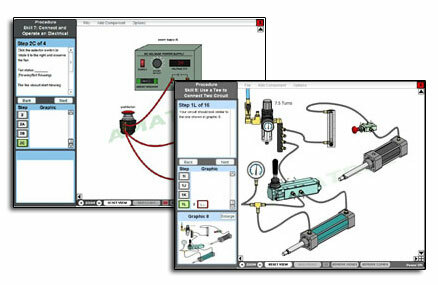 Interactive Technical Skill Development, Hands-On Virtual Simulators! Extending the reach of real industrial skill training beyond the borders of a traditional classroom has become essential as the skilled worker shortage continues to grow. Modern industry increasingly requires a technically sophisticated worker at a time when supply falls far short of the demand. In our fast paced society, developing new skills requires flexible, easily accessed educational material that is available whenever and wherever a student needs it. Amatrol’s eLearning program meets the challenge for flexible technical training by offering superb technical content depth as well as breadth, strong interactivity for skill development, and excellent assessment and student tracking through an intuitive, easy-to-use web portal. With 24 x 7 access, Amatrol’s eLearning program creates easy access to educational opportunities for technical skill development previously restricted to the classroom. The material is self-paced, making it ideal for individual use, traditional class settings, or a blended approach. Amatrol’s proven curriculum is problem-solving oriented and teaches technical skills in a wide range of industrially-relevant technologies. Amatrol’s eLearning program invites students and teachers alike into a highly skilled world where understanding and application integrate seamlessly. Amatrol’s interactive multimedia curriculum uses a competency-based instructional design that teaches industry standard skills. The material meets students where they are in their understanding and leads them forward. Eye-popping graphics, 3D simulations, videos, and complete explanations combine with strong interactivity to develop technical skills. Modern manufacturing involves solving complex problems. Amatrol integrates troubleshooting concepts throughout the eLearning courses. Problem solving within each topical area starts with the basics and then gradually builds to incorporate the complexity found in real world situations. Students can practice sophisticated troubleshooting techniques with confidence that they can translate it to the workplace. Amatrol’s extensive eLearning library contains more than 400 courses and continues to grow and evolve as our curriculum does. These courses fall into categories such as automation, electrical, fluid power, green energy, industry fundamentals, lean manufacturing, machining, manufacturing processes, materials, measurement & gauging, mechanical, prints & drawings, structural engineering, surveying, thermal & process control, quality, safety, workplace effectiveness, CNC machining operation and programming, and many others. simulators let students develop skills at the speed of business. A key challenge of every learning environment is to match learning material to different learning styles. In Amatrol’s interactive multimedia, visual, auditory, and text based learning styles reinforce each other in well organized learning segments. Repetition, active problem solving, and self-reviews all provide feedback to students to build confidence in the skills they develop.Each topical area starts with basic concepts and then leads the student into a layered learning process of increasing depth. Practical application of the knowledge is central to all Amatrol learning materials. Students develop knowledge and then learn how to apply that knowledge to modern industry. Amatrol’s new eLearning Management System (eLMS) is at once both easy to use yet sophisticated in its capabilities. It provides complete learning management from course creation through testing and reporting. Creating tailored courses for specific industries, community needs or even an individual student is easy. Instructors can choose any combination of course segments to tailor a course to their specific needs in seconds. Simply use the ‘Build Custom Course’ form and submit your custom course. It is just that easy! The student experiences the same ease of use as the instructor. When students login, the courses they are registered for show up on the screen and click “Launch” to start. They can start and stop their study as needed. Quizzes provide both student and instructor information on how well the student understands the material. Our new Learning Management System allows the administrator to access courses, view reporting features, manage users and privileges, manage activation codes, build custom courses, and send demo setups. Along with these features the reporting features allow instructors to easily monitor and track learner progress and assess their level of understanding of the skills completed. Testing is tied directly to objectives, enabling quick identification of where additional study is needed. Pre-Quizzes allow assessment before a module is used. To find out more information about our new Learning Management System and our new eLearning contact us today!